ENCINITAS — Encinitas officials are faced with a choice: should it spend its capital dollars on road repairs and facilities maintenance or to finance the purchase of the Pacific View Elementary School Site and the Moonlight Beach lifeguard tower renovation. Tentatively, a divided council chose the latter, voting 3-2 on May 21 to pledge initial support to a plan to sell lease-revenue bonds to finance the purchase of the school and pay for the lifeguard tower renovation as part of the city’s six-year capital improvement campaign. On one side, council allies Mayor Teresa Barth, Lisa Shaffer and Tony Kranz support the idea of selling bonds to pay for the $10 million price tag of purchasing the Pacific View School site and the $3 million bill for the renovation of the aging tower. They said the $743,000 annual debt service, which would last 30 years, is an investment into the community. Kristin Gaspar and Mark Muir, who are opposed to the price tag and debt associated with purchasing the school site, said pledging money to consummate the purchase would mean less money for road repair and city building maintenance. In dissent, both Gaspar and Muir pointed to a staff report just before the discussion that said the city needed to spend $1.6 million more than it currently spends towards road repairs to keep conditions at the level of its current state. The city has more than doubled funding toward road repairs over the past four years, and now, according to a current survey, 75 percent of the city’s streets are in good condition. That number, which is up from 73 percent in 2009, is expected to fall to 72 percent if the city doesn’t commit additional funds, the staff report said. 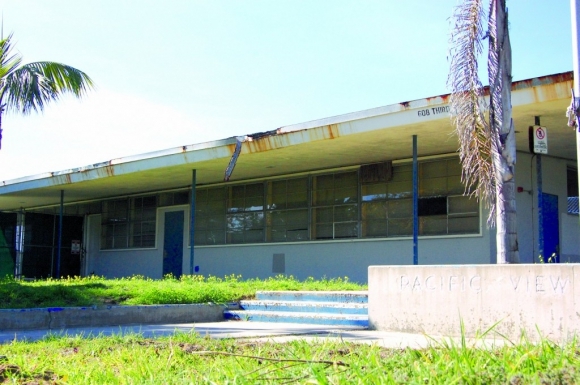 The city agreed to buy the defunct school site from the Encinitas Union School District in April, and now is determining how it will finance the purchase. City Manager Gus Vina said during a presentation on the city’s six-year capital improvement campaign that committing to the two projects would slightly raise the city’s bond-debt ratio to 9 percent, still below the council’s target of 10 percent. City staff favors the funding mechanism over traditional general obligation bonds because they would not require a public vote. Pacific View closed its doors in 2003. The site had been used for school purposes since 1883.